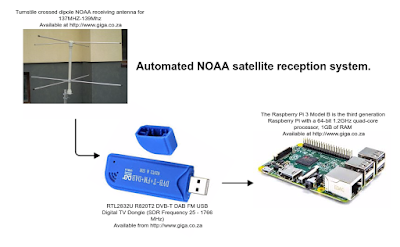 This is the automated NOAA Satellite Image recording system of ZR6AIC. The audio recordings for the images is available here if you want to manipilate it your self with Wxtoimg application. This system is available from Giga Technology. and here is the installation procedure. This system is operated by Anton Janovsky and you can contact me here. This system was started on 17 March 2017 and is situated in Bassonia in the South of Johannesburg, South Africa. This stations position is 26°17.13 S 28°4.25 E, KG43AR if you need it for your Wxtoimg software.